Since coming to Duke University in 2005, Prof. Ramanujam has established the Tissue Optical Spectroscopy laboratory (ToPs Lab_. Prof. Ramanujam's group is innovating on optical strategies to peer into the biological landscape of thick tissues. Technologies being developed in her lab leverage principles of optical spectroscopy, spectral imaging, optical sectioning microscopy, and molecular imaging. Her research group is developing and applying these optically based tools for three problems in cancer: cancer screening in resource-limited settings, intra-operative margin assessment to detect residual disease during cancer surgery, and visualizing tumor hypoxia and metabolism in the context of cancer therapy. Prof. Ramanujam is leading a multi-disciplinary effort to translate these technologies to clinical applications in the breast, cervix and head and neck. In addition to her academic efforts, Prof. Ramanujam has spun out a company, Zenalux, to commercialize several of the technologies developed in her lab. 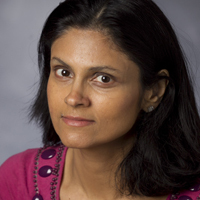 In October of 2013, Dr. Nimmi Ramanujam founded the Global Women’s Health Technologies Center. The Global Women’s Health Technologies Center reflects a partnership between the Pratt School of Engineering and the Duke Global Health Institute. The center’s mission is to increase research, training and education in women’s diseases, with a focus on breast cancer, cervical cancer, and maternal-fetal health; and to encourage and increase retention of women and underrepresented minorities in Science, Technology, Engineering, and Mathematics (STEM) educational disciplines locally and globally. Prof. Ramanujam has received several awards for her work in cancer research and technology development for women's health. She received the TR100 Young Innovator Award from MIT in 2003, a $2.5M DOD Era of Hope Scholar award in 2004, the Global Indus Technovator award from MIT in 2005 and a $3M Era of Hope Research Scholar award in 2009 and an NIH BRP grant in 2011. In 2011, she received the Stansell Family Distinguished Research Award from the Pratt School of Engineering at Duke University. Dr. Ramanujam is a fellow of OSA, SPIE and AIMBE. She is member of the NIH BMIT-A study section and chair of the DOD’s breast cancer research program (BCRP) integration panel (IP) that sets the vision of the BCRP program and plans the dissemination of over $100 M of funds for breast cancer research annually. She is co-editor of the Handbook of Biomedical Optics (publisher Taylor and Francis). Chang VTC, Cartwright PS, Bean SM, Palmer GM, Bentley RC, Ramanujam N., Quantitative physiology of the precancerous cervix in vivo via optical spectroscopy, Neoplasia, vol. 11 no. 4 (2009), pp. 325-332 . J. Q. Brown and L. G. Wilke and J. Geradts and S. A. Kennedy and G. M. Palmer and N. Ramanujam, Quantitative Optical Spectroscopy: A Robust Tool for Direct Measurement of Breast Cancer Vascular Oxygenation and Total Hemoglobin Content In vivo, Cancer Research, vol. 69 no. 7 (April, 2009), pp. 2919 -- 2926 [abs]. K. Vishwanath and D. Klein and K. Chang and T. Schroeder and M. W. Dewhirst and N. Ramanujam, Quantitative optical spectroscopy can identify long-term local tumor control in irradiated murine head and neck xenografts, Journal Of Biomedical Optics, vol. 14 no. 5 (September, 2009) [abs]. L. G. Wilke and J. Q. Brown and T. M. Bydlon and S. A. Kennedy and L. M. Richards and M. K. Junker and J. Gallagher and W. T. Barry and J. Geradts and N. Ramanujam, Rapid noninvasive optical imaging of tissue composition in breast tumor margins, American Journal Of Surgery, vol. 198 no. 4 (October, 2009), pp. 566 -- 574 [abs]. J.H. Ostrander, C.M. McMahon, S. Lem, S.R. Millon, V.L. Seewaldt, N. Ramanujam, The Optical Redox Ratio Differentiates Breast Cancer Cell Lines Based on Receptor Status, Cancer Research, vol. 70 no. 11 (2010), pp. 4759-4766 . Millon SR, Ostrander JH, Brown JQ, Rajeha AM, Seewaldt VL, Ramanujam N, Uptake of 2-NBDG as a method to monitor therapy response in breast cancer cell lines, Breast Cancer Research and Treatment, vol. 126 no. 1 (2011), pp. 55-62 .